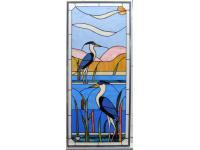 A commissioned panel ordered by a client for her girl friends 50th birthday. Blue heron in the foreground and a smaller blue heron in the background. 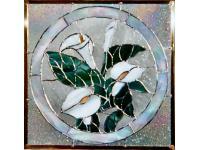 Cala Lily surrounded by clear textured glass then a white iridescent circle all in turn framed by clear hammered texture glass in a square. 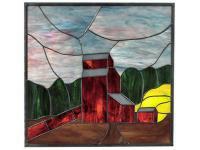 Grain elevator, depicts a nostalgic prairie scene from the past in this window panel. 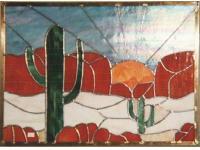 Arizona desert scene of cactus and rolling sand hills in this window panel.